At Armstrong, we recognize that students bring many talents, strengths, and passions to school. Through our specials program, we are able to engage students in learning, while offering a variety of experiences throughout their week. Each week students attend P.E., Art, Music, Library, and Science Lab. This year kindergarten, first grade, second, and third grade receive 60 minutes of Spanish class. 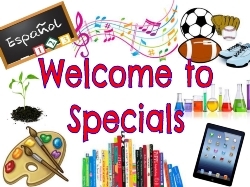 Please see the Staff pages for the individual specials teachers and their information.